Jason Day has spoken often this year about being uncomfortable. "Sometimes ... it's so uncomfortable you feel like I want to run away," Day said after winning the Arnold Palmer Invitational. "It's really uncomfortable. Like, you get that butterfly kind of feeling in your body." And it's not just in winning that Day feels the discomfort. It's also in being the best player in the world -- the spot he's held for the last two months. "I was just telling [golfer Adam Hadwin], 'You got to be okay with feeling uncomfortable because if you're uncomfortable it usually means you're doing something right, especially out here,'" said Day back in March before he retook the No. 1 spot. "I just told him that I was looking forward to being uncomfortable for the rest of my life because I'm uncomfortable out here and I'm in that spotlight," he continued. "If you're No. 1 in the world, go down the supermarket or ... put your head down or something like that or you're out in the golf course, fans want you, media want[s] you. There's a lot of spotlight that comes along with being the best in the world." The great irony here is that few players have ever looked as comfortable as Day does right now as the No. 1 golfer on the planet. But we'll get to that in just a minute. First, a look at his preposterous win that was never really in doubt after a 63-66 in the first two rounds of the tournament. The Australian won his first Players Championship this week by four strokes over Kevin Chappell. Day shot a 71 on Sunday to seal the deal at 15 under (right where he started the third round). It wasn't easy, though. Day had to overcome a 38 on the front nine to nab his seventh (!) win in his last 17 events. He did so in style on the back nine with a 33 that was tied for the second-best on the day. It completed a perfect 36 holes of golf on the back nine at Sawgrass on the week for Day. Not a single bogey on 10-18, the first time any golfer has ever done that. It wasn't the 33 that caught some players' eyes, though; it was a bogey save that Day seems to make more than any other player. "Holing the bogey putt on 9 [was the most important shot I hit]," said Day. "If I walk away with a double bogey there, I let everyone in the field [know the door is open]. That gives them a boost of energy, boost of momentum their way to really say that, 'Oh, OK, we're back in this tournament now. He's not playing well, and obviously he's thinking about trying to win.''" After that bogey at No. 9, Day made three birdies coming home and nobody really got within striking distance. That despite a 73-71 weekend Day put together after torching the course over the first two days. That sounds like the formula of somebody else who has won at this course, mentors Day and was the No. 1 player in the world for a long time. As it sank in on Sunday evening that Day had just pulled off his seventh win since last July (the next closest are Jordan Spieth and Adam Scott with two), players started floating that familiar name. Adam Scott on Jason Day: "It's Tiger-esque." "That's great to be in the same sentence as Tiger," said Day. "It's only half the year, so I've got plenty of opportunities to try and win some more. Like I said out there, I've never been more motivated to be No. 1 in the world. I've never been more motivated to try to extend that lead from one to two. All the hard work that I've put into my game right now has paid off, but I've got to keep working hard to win as much as I can." The craziest part about all of this is that Scott isn't exactly wrong about Day. 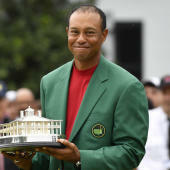 That doesn't mean Day, who now has 10 PGA Tour wins, will ever catch Tiger with 79 or even come close to Woods' 14 majors. But it does mean that nobody -- since Tiger bequeathed the No. 1 slot in the Official World Golf Rankings to Adam Scott in 2014 -- has looked calmer and more at home in those shoes than Day. Four golfers have occupied that position since: Scott, Spieth, Rory McIlroy and Day. Scott and McIlroy often look like the No. 1 players, Spieth putts like one, but Day has separated himself as the best grinder in a sport that demands it at the highest level to win the biggest tournaments. "It's such a big accomplishment for me in my career," said Day. "To be able to finally win as No. 1 in the world and then to go wire to wire was very special. I'm glad I don't have to play the course again." There are more stats to drool over, too. Day joins Woods, Johnny Miller and Tom Watson as the only golfers to go wire to wire in wins at two different tournaments in the same season since 1970. A reminder: It's the second week in May. Players to win multiple PGA Tour events, wire-to-wire (no ties) in same season since 1970: Woods (2x), T. Watson, J. Miller, Day. The wire-to-wire win hasn't happened at this tournament since 2000 when Hal Sutton did it. And Day joins Adam Scott, Tiger Woods, Phil Mickelson and Martin Kaymer as the only golfers with a Players, a major and a WGC win in their careers. Heady company for sure. There's a lot that goes with being the top player on the planet, including sponsor obligations, media tussles and worldwide recognition. It's difficult to shut the noise out which has been a little bit of an undercurrent of a theme with Spieth and McIlroy over the past few years. They've gotten good at it, but it seems like Day is just a little bit better. "It's very stressful being the No. 1 player in the world," said Day on Sunday. "You're in the limelight a lot. You've got more things to do when you get to tournaments, more things to do off weeks. But I wouldn't change it in any way because this is exactly where I want to be. I want to try and stay here as long as I can while I can because nothing beats this feeling." Day has made looking comfortable in an uncomfortable spot (for him) into an art form. "The only two things that I think about in life is my family and golf," Day said earlier in the year. "That's all I want to think about." You get the following that the genteel Australian goes to sleep thinking about hoisting trophies and wakes up thinking about destroying fields. The juxtaposition he's established deserves more credit than it gets. He's forced discomfort upon himself so that he doesn't leave the range early and doesn't shortchange himself on the putting green. As the No. 1-ranked player in golf, it would be easy to do so. "I've always told the media, told everyone before, that just sticking to the process and working hard and then obviously learning from the failures that you have along the way," said Day on Sunday. "You always must learn, and I'm just glad to convert another one." And this is the highest level of achievement. Something Woods was improbably able to do for two decades -- being the best but not resting in it. Who knows how long that will last for Day. "I have the opportunity to do that right now ... try and work as hard as I can to really leave my footprint in this game that has given me so much," said Day. "I'm motivated to be No. 1. I'm motivated to extend that lead, but I'm very motivated to win as much as I can right now. I want it so bad right now. I want to win every single tournament that I'm playing in." For now, he's making it look pretty easy.